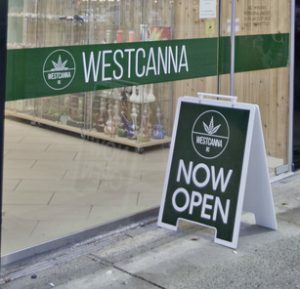 With new marijuana shops and dispensaries opening every week, the demand for retail (weedtail?) store fixtures that suit the unique needs of this burgeoning industry are growing (pun intended). In-store decor and design seems to be a cross between a trendy organic grocery store and an upscale pharmacy — which makes Midwest Retail Services uniquely qualified to assist in the fulfillment (and the custom manufacturing) of display fixtures and merchandising accessories for your cannabis store or cannabis dispensary. Sixty-one percent of Americans favor legalizing marijuana, according to a survey by The Associated Press-NORC Center for Public Affairs Research and the General Social Survey. Support for legalizing marijuana has increased across all age demographics and political party affiliations. Fifty-four percent of Republicans support legalization, up from 45 percent in 2016. Seventy-six percent of Democrats are in favor of legalization. What kind of store fixtures and accessories are best for a Medical Marijuana Dispensary or other legalized weed shop? Space will always be at a premium in retail stores no matter what they sell. Midwest Retail Services can take cannabis products and develop a custom POP display. Custom Point-Of-Purchase displays help set product apart from competitors and we’ve seen them help clients increase their sale of featured products by 25%. We’ll take your toughest merchandise packaging challenge and display a design for you that makes it easy for your shoppers to find and purchase, as well as making it fast and efficient for your customer service team to refill and restock. I’d be happy to work with you to develop a display your competitors will envy! The cannabis industry really appears to stress the organic and natural benefits of their products. Using custom colors on fixtures and displays is a way to make this same impression on customers without using words. Two really good designer colors to consider would be Nubian Brown and Deep Forest Green. These custom fixture colors would work well to display this specialized product category. This is really good area to create a unique store environment with an organic look and feel that complements the product. Much of the cannabis product packaging I’ve seen is in small portion-controlled packing made from plastic or glass. Midwest Retail Services has a great solution for the glass bottles — Uniweb trays and fixtures. 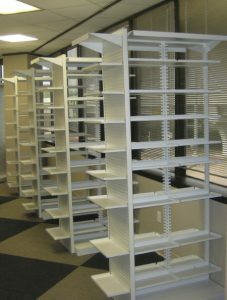 These durable shelves are available in an 8″ or 12″ base deck, can be custom powder coated in over 200 colors, and Uniweb will manufacture these fixtures to meet almost any height or width requirement. Perhaps most importantly, the trays have an up-lip on all sides which helps prevent glass bottle from falling off and breaking on the floor. A recent medical marijuana dispensary client asked me to provide a quote for the Tubular Pharmacy bay system from Madix, but after speaking with him and hearing his description of its intended use and products to be merchandised, he really needed a deeper shelf than the typical 8”D pharmacy tray so I told him about the 12″ – 15″ deep trays from Uniweb. In the end, he chose the Uniweb brand fixtures and 12″ deep shelves. This is a good reason to take a little extra time and speak with a professional fixtures representative, rather than just shopping online or asking for pricing on a single display type you may be familiar with. In a 10 or 15 minute phone call I can ask you some questions you may not have thought of before and guide you in the right direction. Although most weed shops are currently prescriptive in nature, who knows what the future will bring with marijuana legalization? One retail store fixture which might be perfect for cannabis products could be our BulkShop system. These bulk product dispensers are already perfect for use with natural foods sections in grocery stores, so I think they’ll feel very familiar and perfectly placed within cannabis shops. I’d recommend a couple of rows of dispensers and couple of rows of acrylic scoop bins. Custom signage can be created for different blends (just like the bulk sections for chocolates and coffee beans). Change products and brands as often as you like. 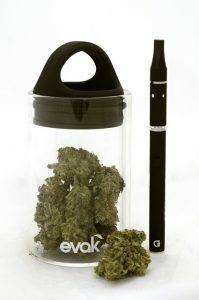 The acrylic bins can be used for larger buds that won’t fit in the dispenser system, accessories, or even some types of edibles. Buds in Bulks may be the wave of the future! Have a new retail project you’d like to discuss? Click here to contact us and one of our knowledgeable fixture experts will be happy to connect with you to see if we can help! This entry was posted in Ask The Team, Industry Specific Retail Fixtures, Pharmacy, Retail Trends and Display Tips and tagged ask the team, Display Fixtures and Shelving, improving store layout, Problem-Solving, Retail Display Tips, Retail fixture, Retail Made Easier, Retail Store Shelving, Rx drug storage bays, Shopping Experience, Small Business, Store Shelving, Tips I Can Use, Trends to Watch, What's new I Can Use by Midwest Retail Services. Bookmark the permalink.